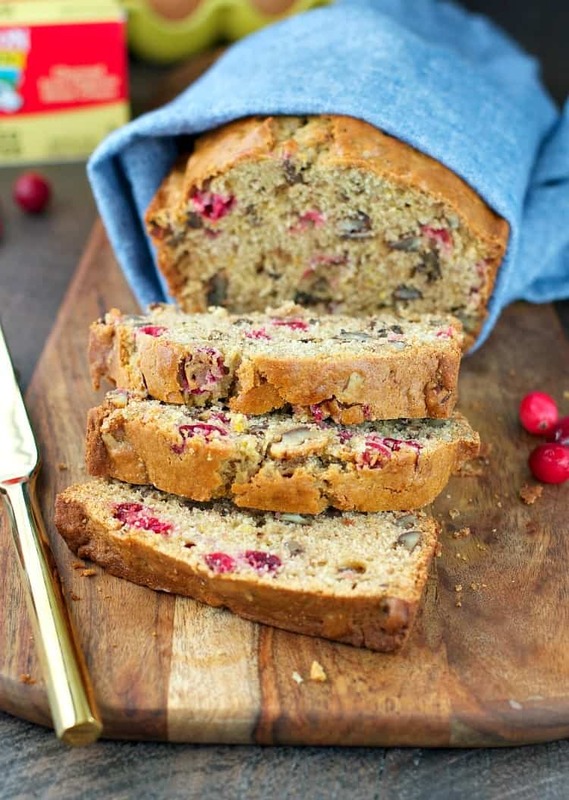 A delicious and easy cranberry bread that takes only 15 minutes to prepare and makes a perfect holiday gift or festive breakfast. I don’t consider myself a baker. At all. Yeast breads scare me, my layer cakes are always lopsided, and you can just forget about fancy cookies. But when the Christmas season comes around, I love nothing more than to roll up my sleeves, spread the flour on the counter, and roll out some sugar cookies with the kids, decorate (pre-assembled) gingerbread houses, and pop a few loaves of Mom’s Cranberry Bread in the oven. For me, cooking is a way to show love. 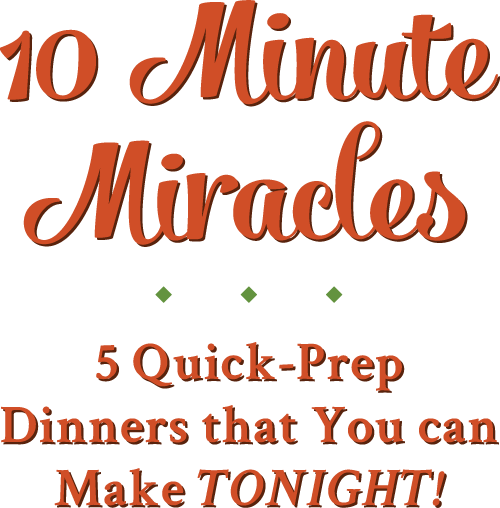 I nourish my husband and kids with homemade dinners throughout the year as a way to take care of them. And ever since I can remember, I have been gifting food to my friends and family for the holidays. Long before I had my own kitchen, I would torture my mom with trays and trays of cookies on her counter, butter in her refrigerator, and muffins in her oven. Nothing has changed, and I still enjoy spoiling my kids, neighbors, and teachers with sweet treats at this time of year. 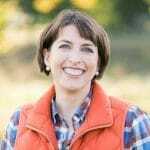 Over the years, however, I have learned a few tricks to keep holiday baking stress-free and successful (even for a novice like myself). First of all, I stick with what I know will work! Baking does not allow room for experimentation, so I measure my ingredients and follow the tried-and-true recipes that we have loved for years. 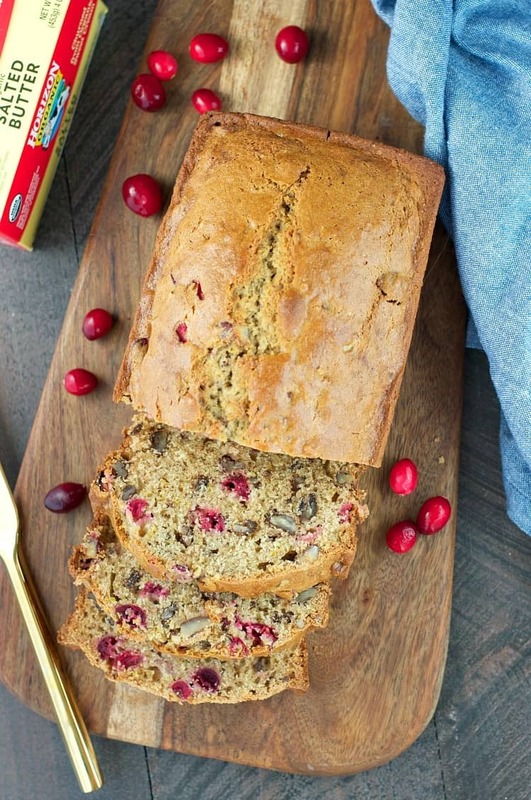 My Mom’s Cranberry Bread is one of those guaranteed winners! 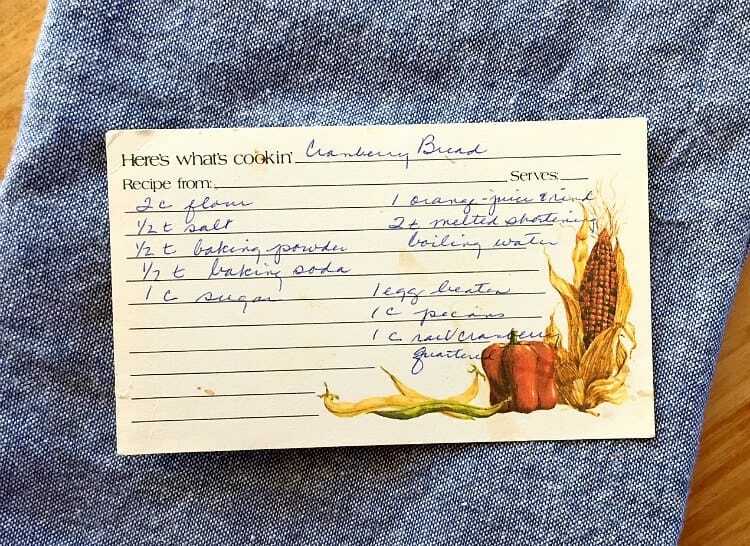 Don’t you just love the stained, browned old recipe card that is about as old as I am? I consider these handwritten mementos little family treasures that I will hold onto forever! I carefully select easy baking projects — this Cranberry Bread only requires 15 minutes of prep — and I always make sure that I use the best ingredients. 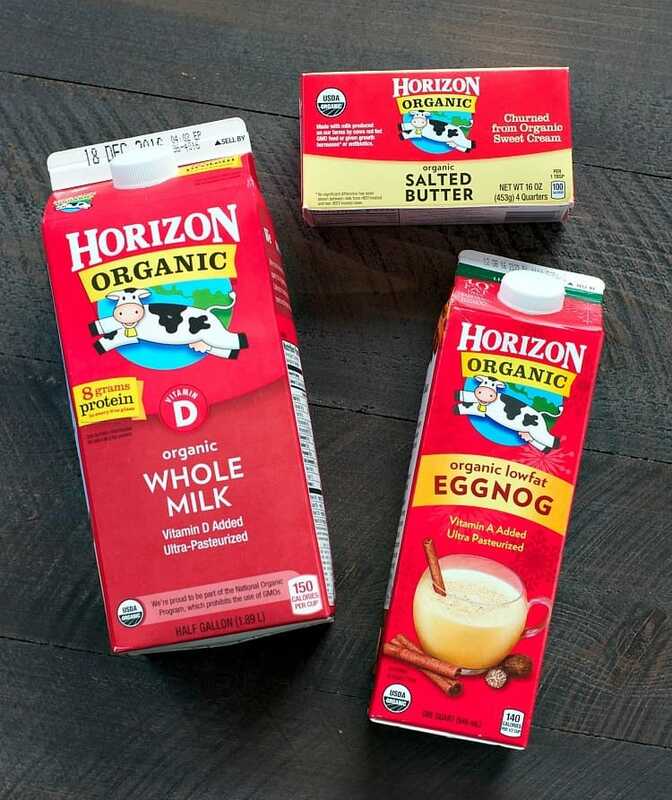 The Horizon Organic dairy products are my favorite high-quality options. They help me create wholesome, simple, and delicious holiday treats that turn out perfectly every single time! 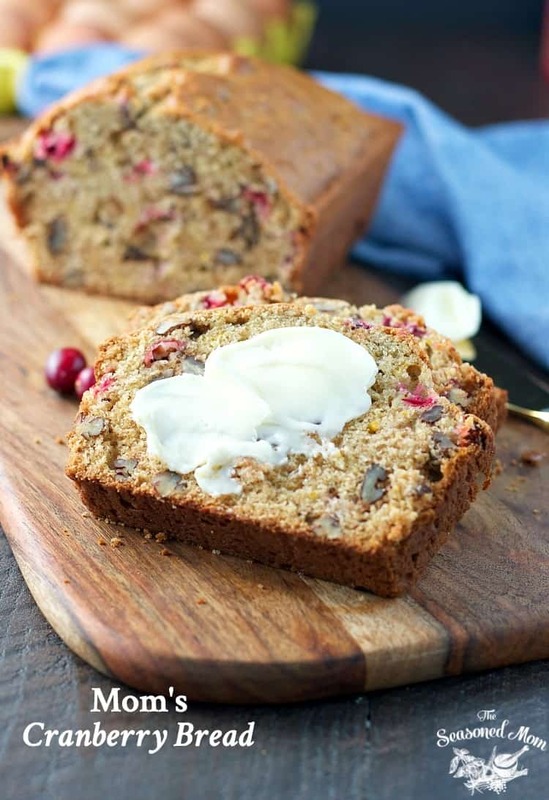 This Cranberry Bread recipe takes advantage of Horizon Organic Butter and either Horizon Organic Milk or Horizon Organic Eggnog. I love the added holiday twist of the eggnog in this treat, but milk is a perfectly acceptable option too! I try to balance out the holiday indulgences and include plenty of good-for-us ingredients as well — including fresh cranberries, pecans, whole wheat, and organic eggs. 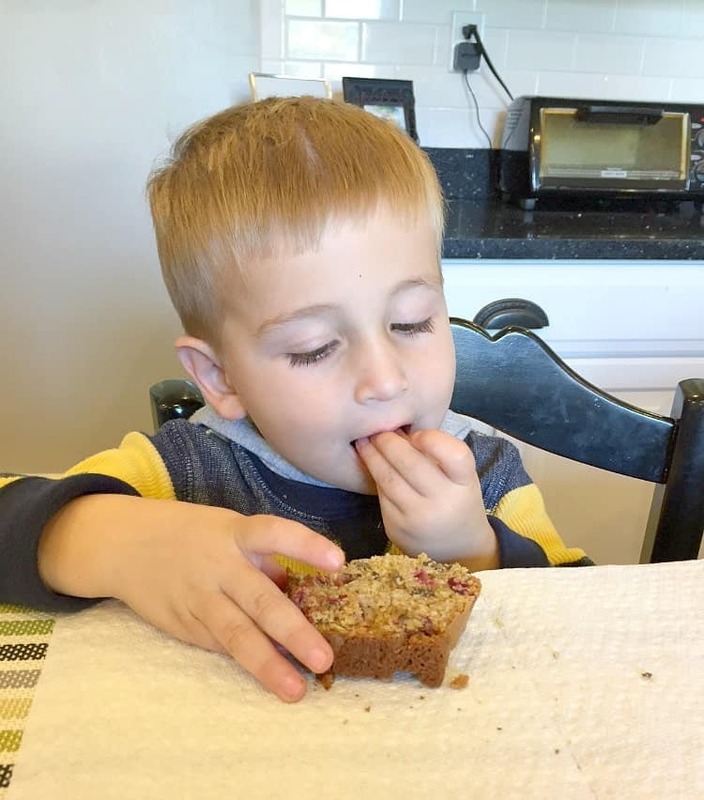 The end result is a moist, tender loaf of Cranberry Bread that is bursting with tart berries and chunks of buttery pecans. It’s just simple, real ingredients that come together in a naturally beautiful way. 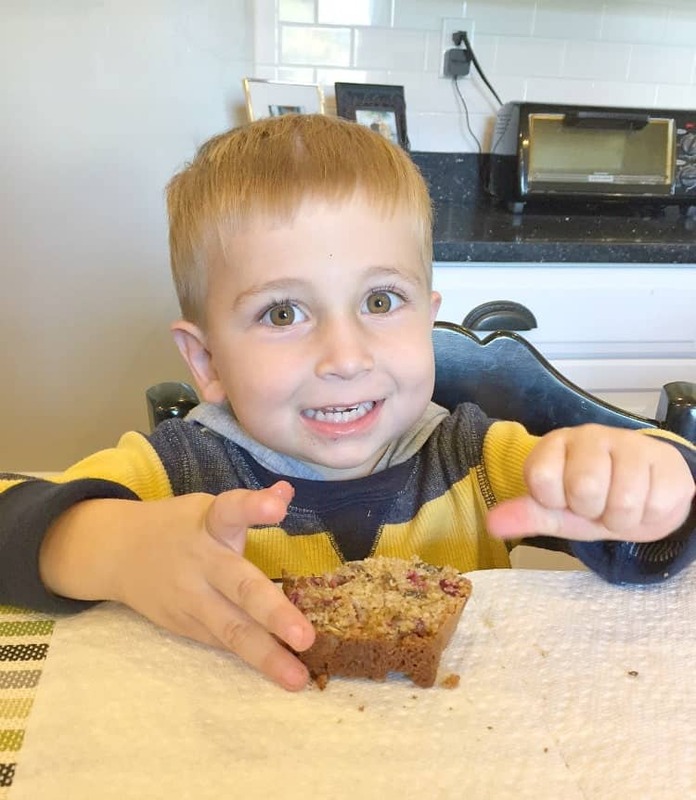 And you can trust me when I say that Mom’s Cranberry Bread is 100% approved by every big (and little) boy in my house. I was pleasantly surprised that even my youngest guy requested two slices in one sitting as soon as the loaves came out of the oven. A true holiday baking success! Show your family and friends how much you appreciate them by sharing a loaf of freshly-baked Cranberry Bread with them this season. You can bake the loaves in advance, wrap them tightly, and store them in the freezer until you’re ready to share. 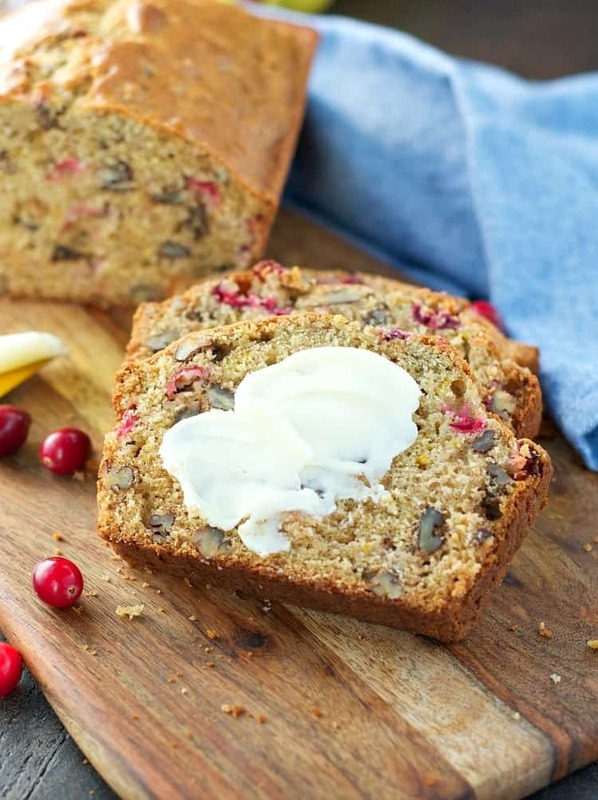 A loaf of Cranberry Bread makes a thoughtful holiday gift, a tasty afternoon snack with a cup of tea, or a lovely addition to a brunch buffet. And best of all, there are no special baking skills necessary! 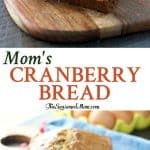 If you’ve tried this Mom’s Cranberry Bread Recipe or any other recipe on The Seasoned Mom then don’t forget to rate the recipe and leave me a comment below! You can also follow me on Facebook, Twitter, Instagram and Pinterest to see what I’m getting up to. 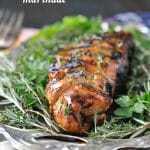 Preheat oven to 325°F/190°C. Spray a loaf pan with cooking spray and set aside. In a large bowl, sift together dry ingredients (flours, salt, baking soda, and sugar). In a large measuring cup, combine melted butter, orange juice, and milk (or eggnog) to equal 1 cup. Add egg to the wet ingredients. Whisk until completely combined. 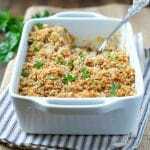 Pour the wet ingredients into the dry ingredients and stir until just combined, being careful not too overmix. Gently fold in pecans, orange zest, and cranberries. Bake for about 60-75 minutes, or until a toothpick inserted in the center comes out clean. For even more great ways to enjoy Horizon products this holiday season, be sure to sign up for the Horizon Newsletter or follow the brand on Facebook, Instagram, Pinterest, and Twitter. Enjoy! 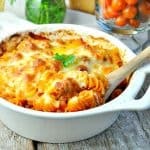 I bet this would be extra delicious with a cup of tea.Yum! 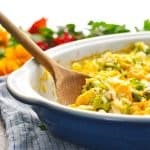 Have you ever double this recipe?